Wondering what’s on-trend in the gardening world? 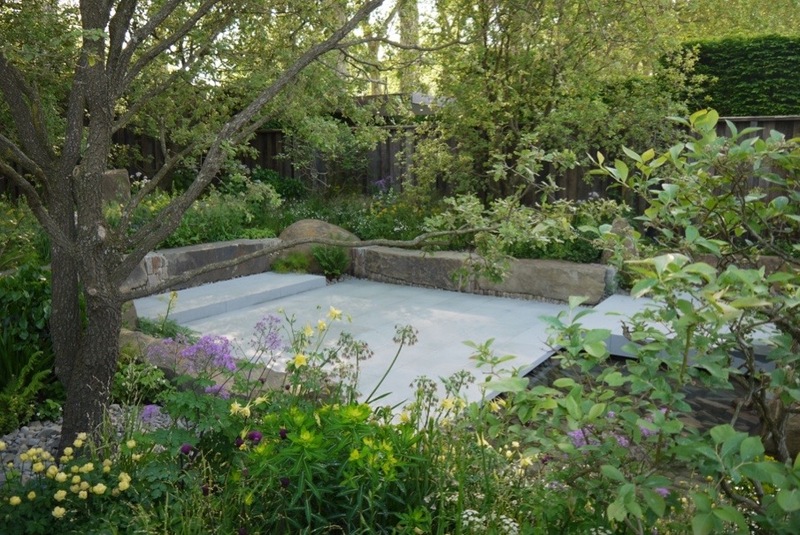 Our columnist Manoj Malde offers inspiration with a round up of what caught his eye this year at Chelsea. Every May the haute couture world of horticulture comes to Chelsea. It is the Chelsea Flower Show. What many of us do not see is the preparation work that starts at least a year in advance for each garden. Designers start putting their creative thinking caps on, nurseries are hard at work growing plants to pure perfection and contractors have the grand task of bringing the designers’ visions to life. 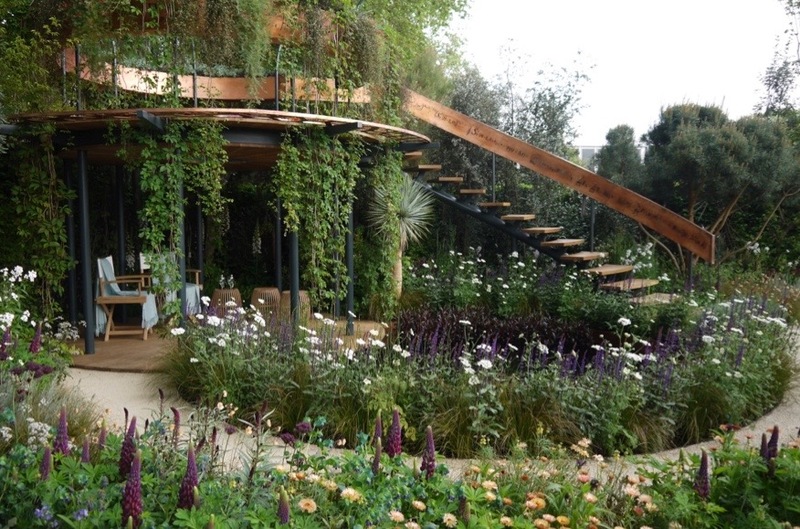 The Chelsea Flower Show truly paves the way for sales throughout the horticultural industry. What will become the must have plant? Which water feature or piece of sculpture will the audience coo over. Well here are the trends for 2016. Trees made a real statement this year. Pines are really on-trend. The best looking pines were Pinus sylvestris ‘Watereri’ seen on The Beauty of Mathematics Garden. Multi-stem trees were seen in most gardens. The M&G Garden had spectacular multi-stem Quercus pubescens (oak trees) that provided dappled shade to a peaceful open space. The Telegraph garden used a wind-blown strawberry tree that had a sculptural quality. Orange and copper are the must have colours. These were used through planting schemes, structures, metal work and soft furnishings. Orange geums were seen in many gardens. Choose from Geum ‘Mai Tai’, Geum coccineum ‘Cooky’ and Geum ‘Alabama Slammer’. Plant them through drifts of Carex testacea. The Beauty of Mathematics Garden (main picture) had the best planting scheme. Nick Bailey used a beautifully muted colour palette of oranges, coppers and cinnamon balanced with clarets, blues, amethyst and highlights of white. The LG Smart Garden had a sweet colour palette that reminded me of sugared almonds. 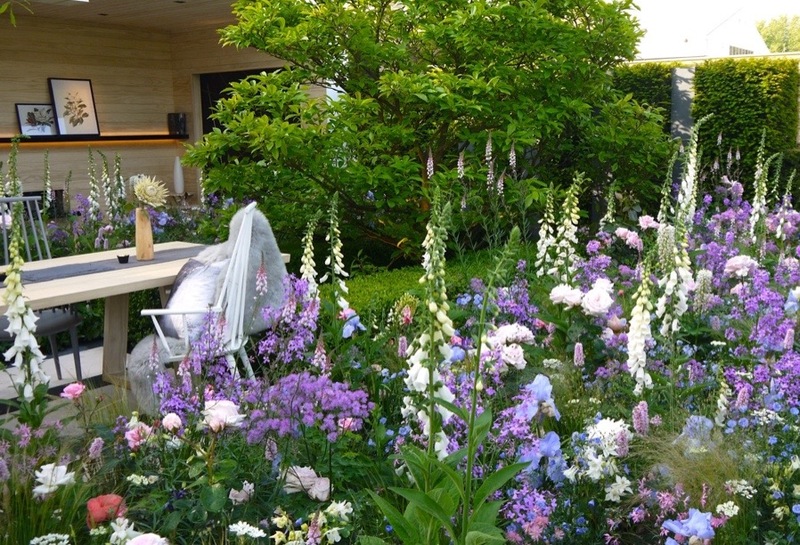 Dusky pink roses, pale blue Iris, lilac hesperis, white Orlya grandiflora and tall spikes of foxgloves, wedgewood blue Brunnera, baby pink Aquilegia, Linaria and Lupins were worked into an intricate tapestry. The Chelsea Barracks garden had a warm sensuous colour palette of wines, purples, pinks, sherbert and blues. Luxury lifestyle and outdoor living is what it’s all about. 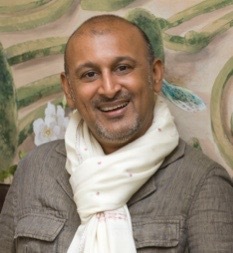 The Mindful Living Garden was a garden which I associated with penthouse living. The designer had created a beautiful outdoor lounge space. I could really imagine myself using this space to relax, do some yoga, be soothed by the sound of water and comforted by lush planting. The garden definitely has a luxury spa quality. The Telegraph Garden captures the luxury of Mediterranean outdoor living. The rear section of the garden becomes a very private space. Invite friends for evening drinks and while away the hour around the glow of a stunning fire bowl. The Beauty of Mathematics Garden is pure indulgence. It is luxury at its best. I had the honour of seeing the garden at night. It becomes a truly magical place when the copper metalwork is lit up. The naturalistic planting is pure genius. The twisting pathways create journeys and intrigue. The L’Occitane Garden is perfection of a landscape. Another Mediterranean garden but this one transports you to Provence. Skilled artisans from Provence constructed all the stone work, bringing this garden to life. Planting schemes were much more individual this year. Orange Geums were all the rage this year as were Lupins and Foxgloves. Grasses were cleverly used to soften planting adding a more naturalistic look. The Beauty of Mathematics Garden showed a fragmented meadow with lots of Briza media planted in broken drifts, dotted with Geum ‘Mai Tai’, Centaurea ‘Jordy’, Reseda, Calandula, Salvia officinalis and Alliums. Many unusual plants were seen in the gardens this year. Mediterranean planting seems to be in vogue. Some of my favourites are Isoplexis canariensis, Yucca rostrata, Lotus berthelottii, Trifolium rubens, Asplenium trichomanes, Aloe polyphlla, Aeonium tabuliforme, Rhodohypoxis and Corokia cotoneaster. However, many of these are tender so do check their requirements before purchasing and planting. The Beauty of Mathematics Garden with copper metalwork and copper tones worked through the planting scheme. 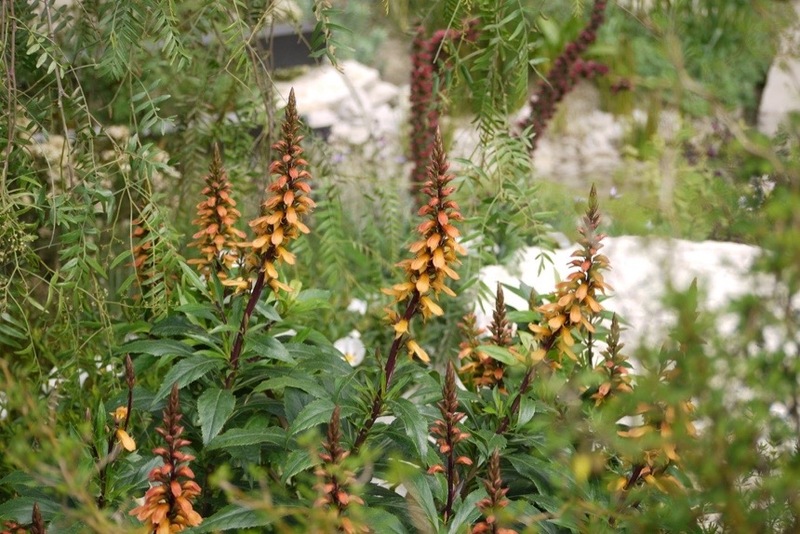 Isoplexis canariensis as seen on the Telegraph Garden. 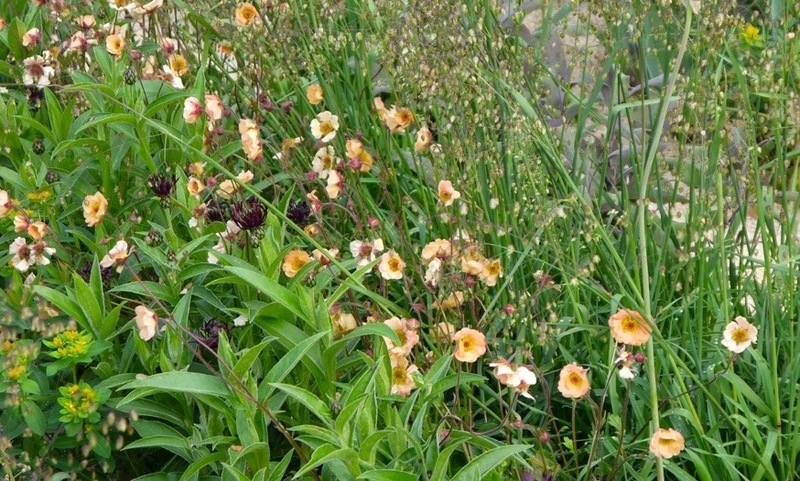 Coppery flowers of Geum ‘Mai Tai’ planted through a drift of Briza media. 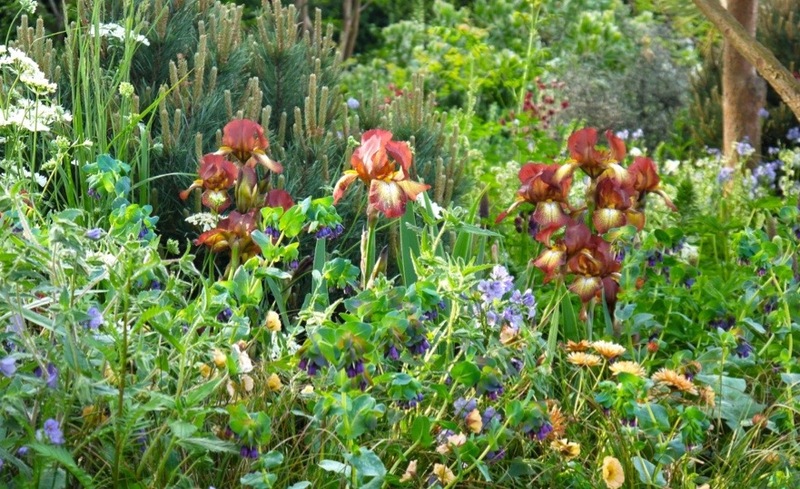 The dark copper colours of Iris ‘Kent Pride’ bred by Kelways nursery are offset with Cerinthe, Carex testacea and Calandula. 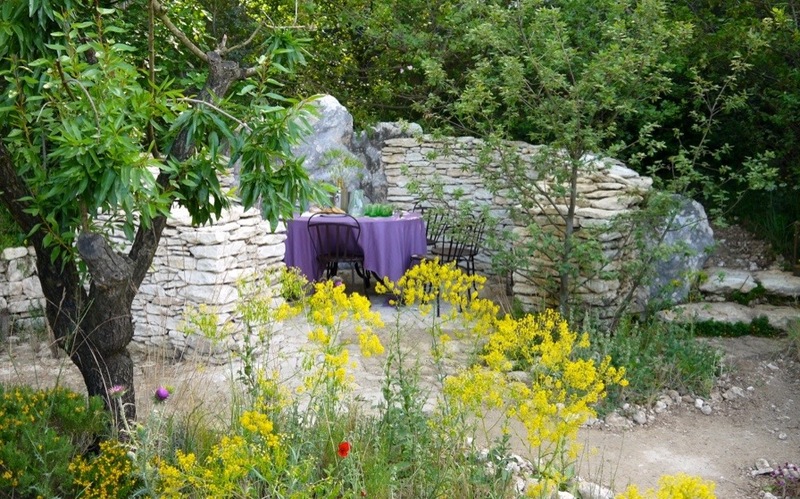 A cosy outdoor dining area created by skilled stone artisans from Provence for the L’Occitane Garden. Sugared almond planting scheme at the LG Smart Garden.